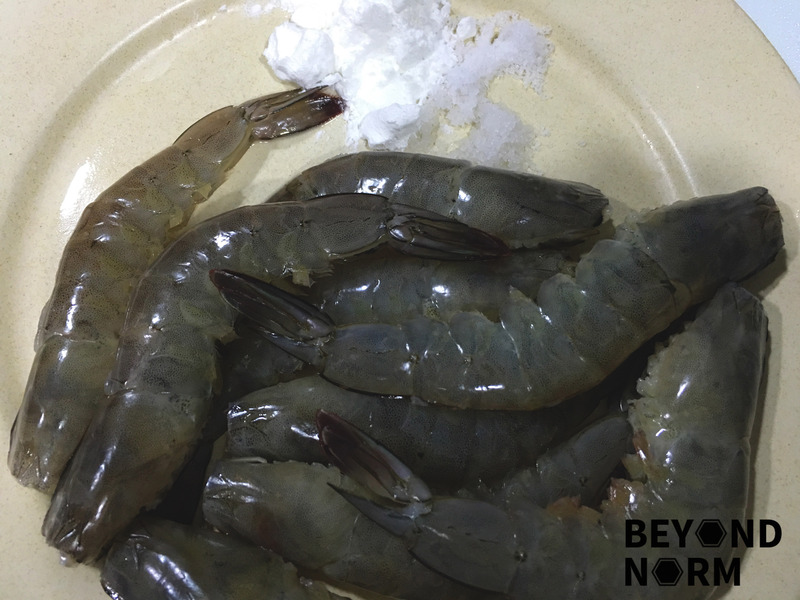 One of those dishes that will bring back some memorable childhood was those big prawns cooked with dark soy sauce by my mum. When my children were growing up, I often cooked them; as these were some simple dishes which I knew. Surprisingly when my daughter was in Perth and she felt homesick, she would cook this dish too!! However, today I made this dish with a twist by adding in a secret ingredient; Ribena Blackcurrant Juice (concentrated). Yes, you read that right. RIBENA was added into the dish! This dish was created in collaboration with Ribena Singapore and Share Food. When I was approached to create a savoury dish using Ribena, I was like you: very doubtful any delicious dish can be created. Here, I have proven myself and you wrong. The result was excellent! Since prawns signify laughter (HA HA HA!!) 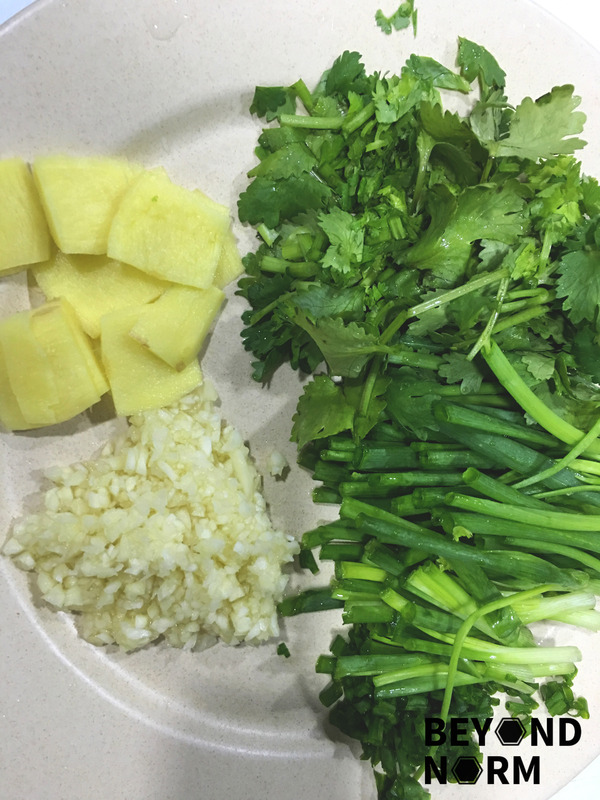 it will be a highlight to cook this dish for your reunion dinner or during one of the Chinese Year‘s meals and bring more laughter and happiness to your family and friends. Another dish that is created by Mummy’s Kitchen for your enjoyment using Ribena. If you like this dish and want more cooking ideas, we love to hear from you either via our blog or by joining our Mummy’s Kitchen Facebook Group. 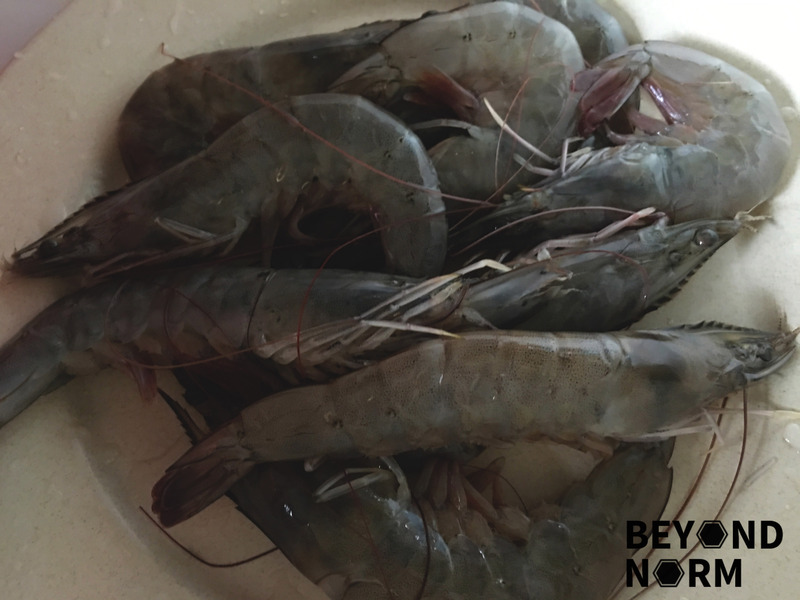 You can also like us on Beyond Norm’s Facebook Page or subscribe to our blog via the right side bar to get the latest updates. Gong Xi Fa Cai! 恭禧發財!! With kitchen scissors, snip off all their legs and trim off the sharp points on their heads. Rinse and pat the prawns dry. Combine the cornflour and the salt well. Coat the prawns with the above mixture and set aside. Heat up 1 tablespoon of oil in a non-stick frying pan at medium-low heat. 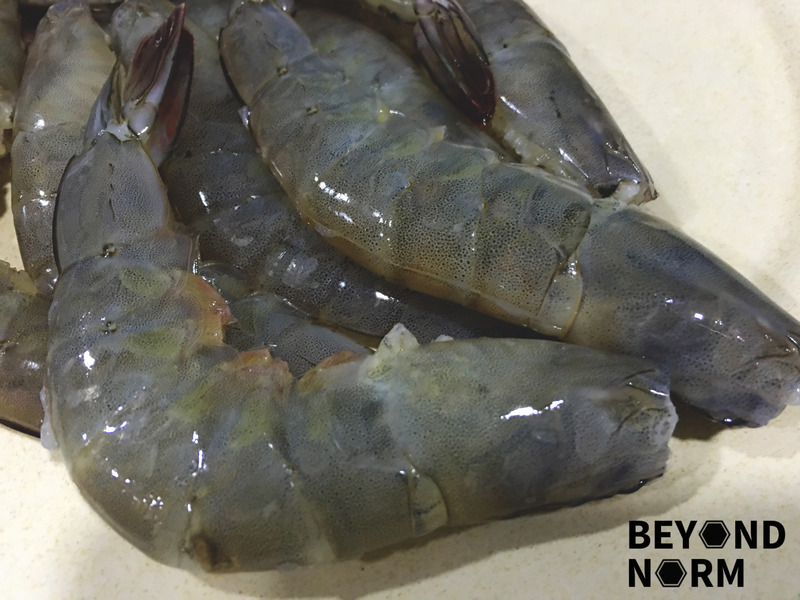 Once it is hot, add the prawns and cook till they change colour. 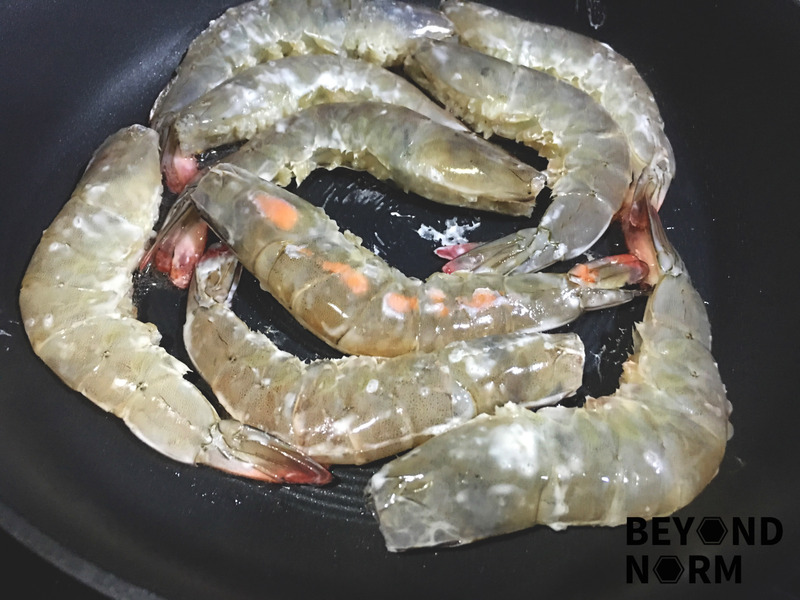 Remove prawns from the pan and set aside. Next, sauté the garlic and ginger until fragrant. Turn the heat to low. 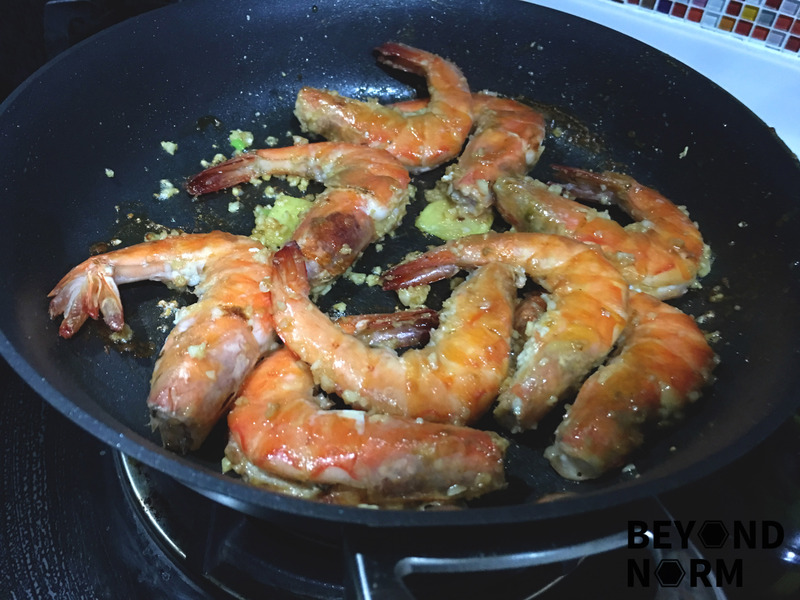 Transfer the prawns back to the pan and mix well with the sautéed ingredients quickly. Add in the dark soy sauce and Ribena and toss the prawns around in the sauce, coating evenly for about a minute. Add some salt to taste if needed. Turn off the heat. Stir in the spring onions. Drizzle the sesame oil and add the Chinese cooking wine and give it another quick stir. Dish the prawns on a serving plate and garnish. Serve immediately.